Think candy floss, cake pops and decadent golden chocolate eggs, and you get a sense of the fun in store at this Covent Garden hotel. 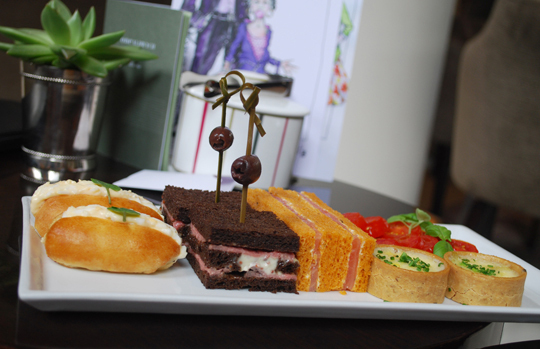 Just a hop, skip and a jump from the London theatre where the musical version of Roald Dahl’s Charlie and the Chocolate Factory has been playing to sell-out audiences, the story can be continued at One Aldwych Hotel with a Charlie-inspired afternoon tea. Think candy floss, cake pops and decadent golden chocolate eggs, and you get a sense of the fun in store at this Covent Garden hotel. 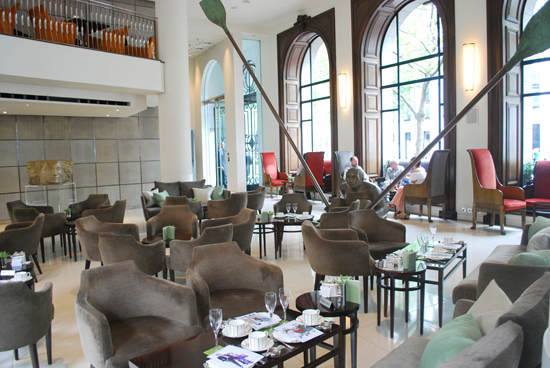 For our afternoon tea experience with a twist, we were seated in the hotel’s Lobby Bar – a bustling day-into-evening space where visitors and hotel guests come and go for coffee, informal meetings, drinks or simply to sit and read the newspaper. All around the space are striking sculptures and imaginative floral displays, while the building’s many original, towering Austrian Oak arched windows let the summer sunlight flood in. The sense of theatre began almost immediately with the arrival of our Cocktail Charlies. 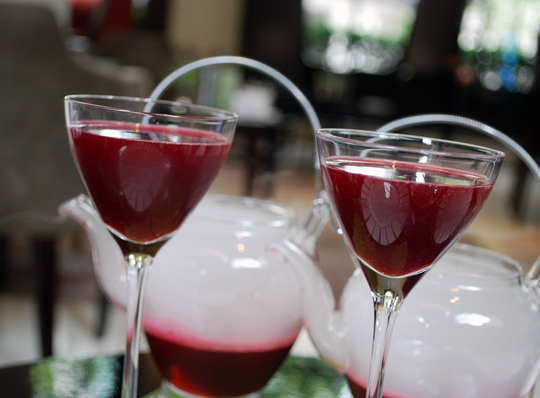 Two glass teapots filled with bubbling, smoking red liquid were delivered ceremoniously to the table and poured into delicate little cocktail glasses. The drink – a mix of Dalmore whisky, cherry liqueur, chocolate bitters and grapefruit juice topped with champagne, was unctuous and delicious and whetted our appetite for what was to come. The tea selection, while not large, was perfectly matched to the theme. I normally play safe with English Breakfast or green tea, but this time I was tempted by the Mango Noir – a fruity blend of black China tea with strong mango notes – and I wasn’t disappointed. 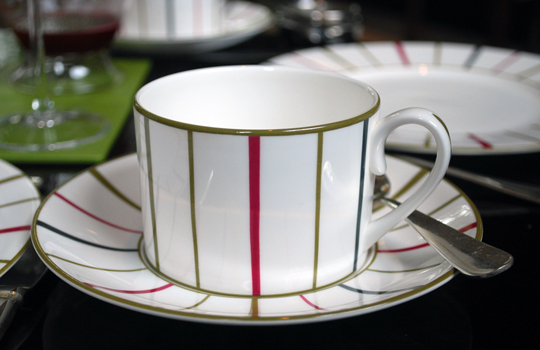 It was served from a lovely elliptical white teapot with a modern striped design, which was part of a British bone chinaware set from William Edwards. The other enticing teas on offer were Green Dragon (sencha with a kick of lemongrass, lemon oil and ginger); English Summer Garden (hints of rosebud, strawberry leaf and lemon verbena); Sugarcane Black (black tea roasted with raw red cane sugar for a caramel sweetness); and fittingly, a Chocolate Tea (Chinese Yunnan Black, Peruvian cocoa nibs and Madagascan vanilla pod). 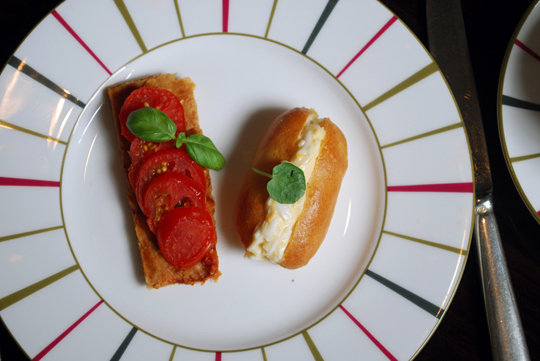 The savouries came as Act II, with a selection of smoked salmon and herb crème fraiche sandwiches, egg mayo and watercress mini buns, roast beef and mustard mayo on rye bread, heritage tomato tarts, and leek and salmon quiche. 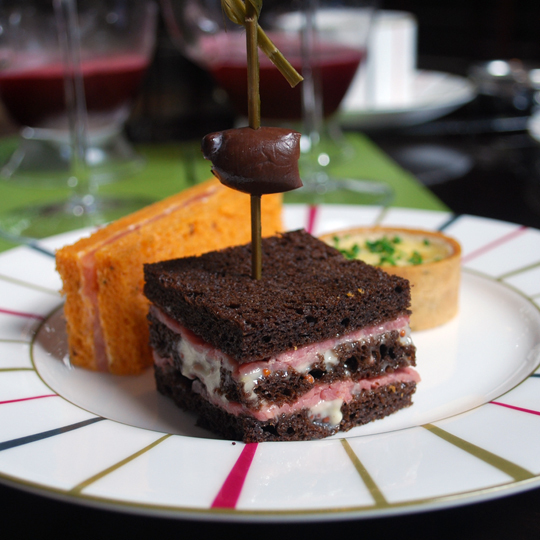 The stand-out savoury item for me was the roast beef sandwich stack – rare beef with tangy grain mustard, a green olive, and chocolate-coloured bread that gave it the appearance of being a delicate little cake. Guests should be warned, if you’re a fan of classically-cut and filled sandwiches, there’s really only the slim salmon finger sandwich option that comes close. If you’re still feeling hungry, however, the friendly and attentive serving staff will offer the option of seconds. The rest of the savouries were decent, if a touch forgettable. I couldn’t help but feel they lacked the element of surprise and intrigue that was to follow with the sweet section. 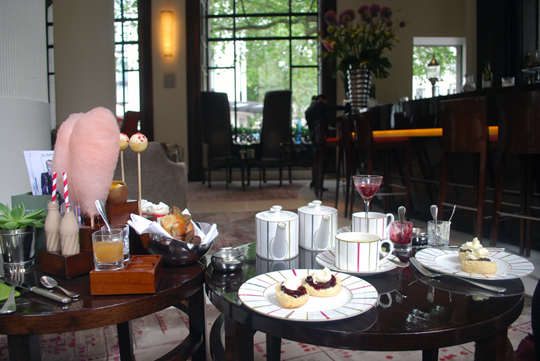 Act III – the sugar-filled finale – was undoubtedly the highlight of the afternoon tea performance! Delivered on a tiered wooden box, we were treated to a colourful visual feast of peach-coloured candy floss, chocolate and caramel milk in little glass bottles with candy-stripe straws, lemon and raspberry cake pops, pots of Eton mess, financiers in the shape of cocoa beans, blueberry brioche and cute chocolate eggs with their tops cut off. The eggs were the stars of the show; thick tempered chocolate shells dusted with golden powder, and inside an ‘egg white’ of light vanilla cheesecake and a ‘yolk’ of sweet and sticky mango sauce. What a treat to eat. 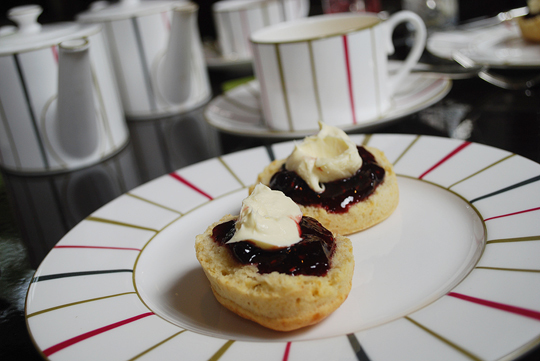 There were delicate scones too, served with a selection of berry jam and apple & meadowsweet compote, and properly-thick Devonshire clotted cream. 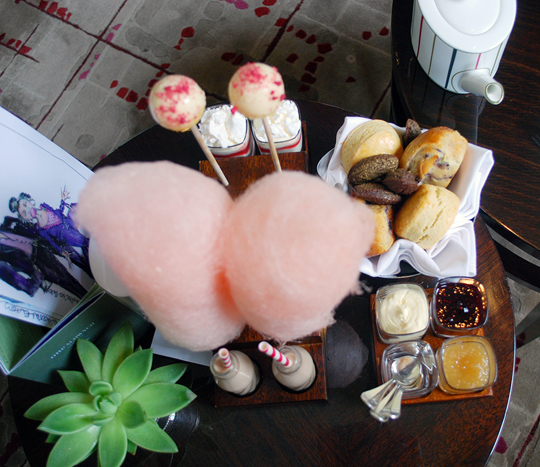 The flavour of the fruity homespun candyfloss was left to our imagination, but we guessed it was possibly watermelon. The financiers were rich and fudgy, and the Eton mess perfectly light. The only disappointment was the blueberry brioche, which was bordering on dry rather than buttery. All in all, it was a nice combination of flavours, nothing was too rich, and we were grateful that One Aldwych’s executive chef Dominic Teague hadn’t gone overboard with the whole chocolate theme. Teague says that before designing the tea, he was careful to re-read the much-loved Roald Dahl children’s book (first published in 1964) to find some foodie inspiration. 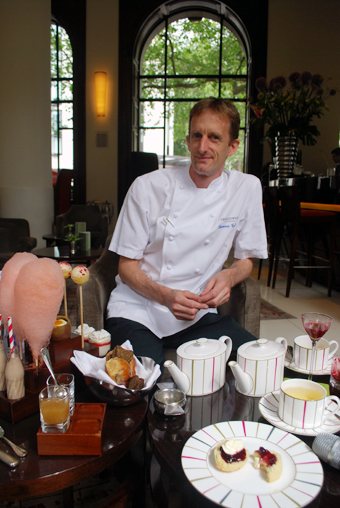 Teague has certainly captured the essence of Roald Dahl in his afternoon tea masterpiece, and you don’t need to be a fan of the author’s work to enjoy the sheer inventiveness of it all. One Aldwych also has its own unique story to tell. The quirky triangular building (yes, it’s shaped like half a sandwich) – located near to the artsy Somerset House and opposite Waterloo Bridge – was built in 1907 as the home of The Morning Post newspaper. Designed by the famed Anglo-French partnership of Charles Mewes and Arthur Davis, who were also behind the Ritz hotels in London and Paris, it’s now considered one of the most important Edwardian buildings in London, protected by English Heritage. While honouring the building’s rich history, One Aldwych Hotel (opened in 1998) now champions the work of rising contemporary artists, and creative talents such as Mark Siredzuk, its very own in-house sculptural florist. 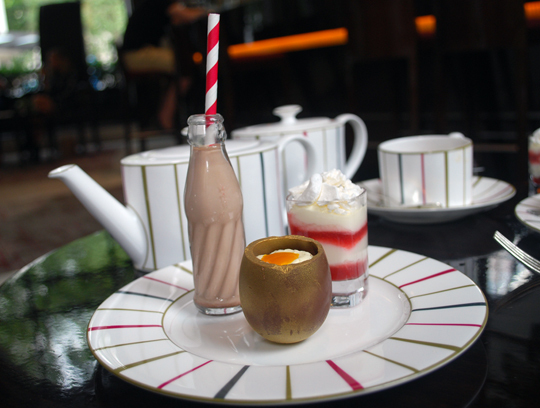 It’s this wonderful mix of history, modernity and creativity that makes One Aldwych the perfect place to celebrate the literary genius that was Roald Dahl, along with the hotel’s own charming take on a ‘scrumdiddlyumptious’ afternoon tea. Gluten-free, vegan and vegetarian menus available on request. Monday to Saturday 12.30 to 3.30pm and Sunday 12.30 to 4.30pm. 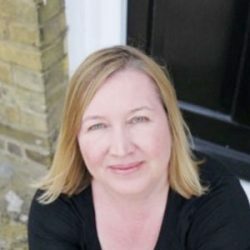 A two-hour sitting is £39. With a glass of Champagne or a Cocktail Charlie, £49. Children under the age of 12 - £29.